The surprise snow storm on Thanksgiving gifted us with a lot of windfall, as many branches broke, unable to hold the heavy, wet snow, leaving the ground scattered with debris. The timing was perfect, saving me from having to cut greens for my seasonal holiday decorating. That’s Yankee thrift for you! 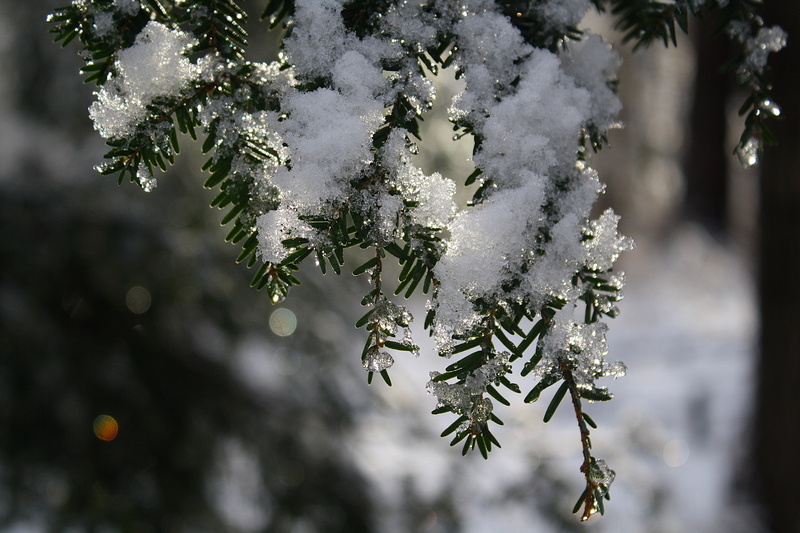 We have only one balsam fir on our property and it is 50′ tall, so cutting young growth is pretty much impossible. I was delighted rather than dismayed to see three large boughs on the ground. I dragged them to the garage where the snow could melt off, to await my use. 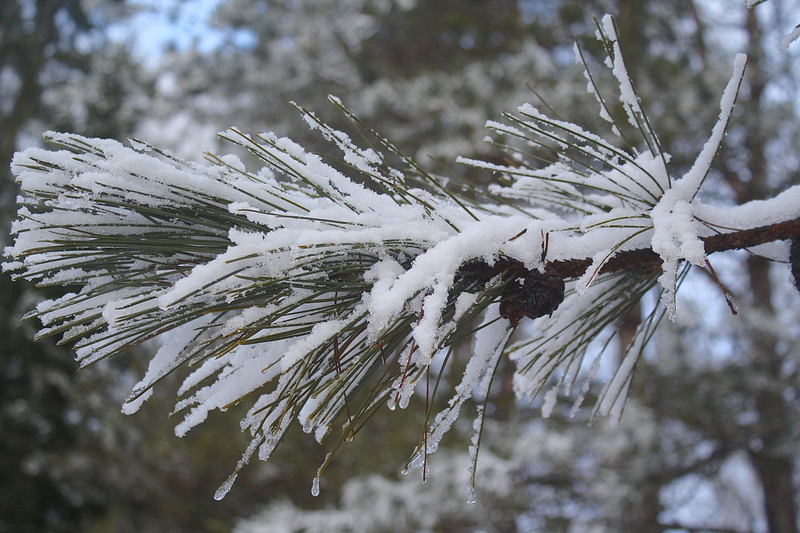 I did the same with several pines boughs. Not every year is a good one for pine cones, so in a prolific year I collect the fine ones when I see them. They can be saved and re-used for many years. I needed a base for my wreath, having used my wire base making a hydrangea wreath this fall. I recalled a tangle of wild grape vine that we had to cut and pull off one of our trails, so I headed down and wound several long vines into a simple, strong, firm base about 15″ in diameter. I clipped a large pile of 6-8″ pieces of balsam and pine, attaching bunches of four or five pieces at a time to the vine base with spool wire. It didn’t take long and I enjoyed the process of creating this symbol of the unending yearly cycle. Checking for symmetry, I stuck extra pieces into the frame until pleased with the result. 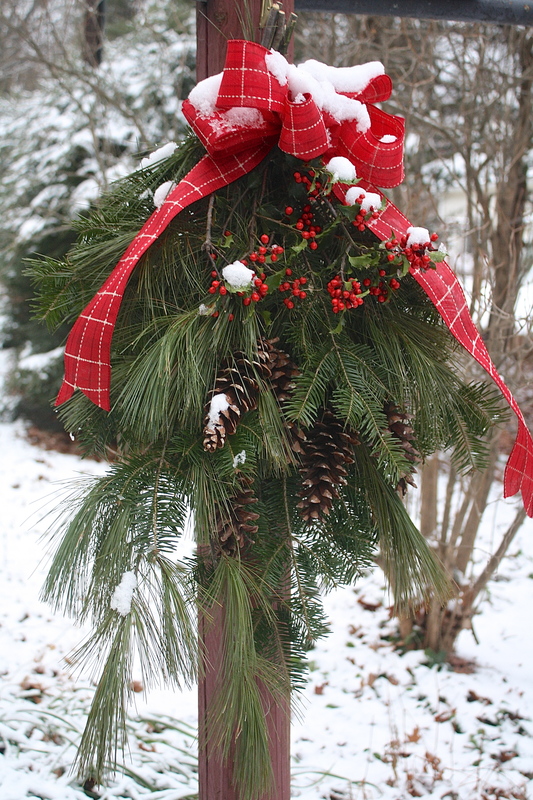 A bow, pine cones attached with wire and it is finished with sprigs of winterberry. I most often prefer the simple natural look, but in years past have made a range from glitzy gold to fruity della Robbia. I hang the wreath on the wood shed where it can be seen from the road. I decorate the mailbox post with a swag as well. We don’t get a ton of visitors, so these are my ‘public’ displays. 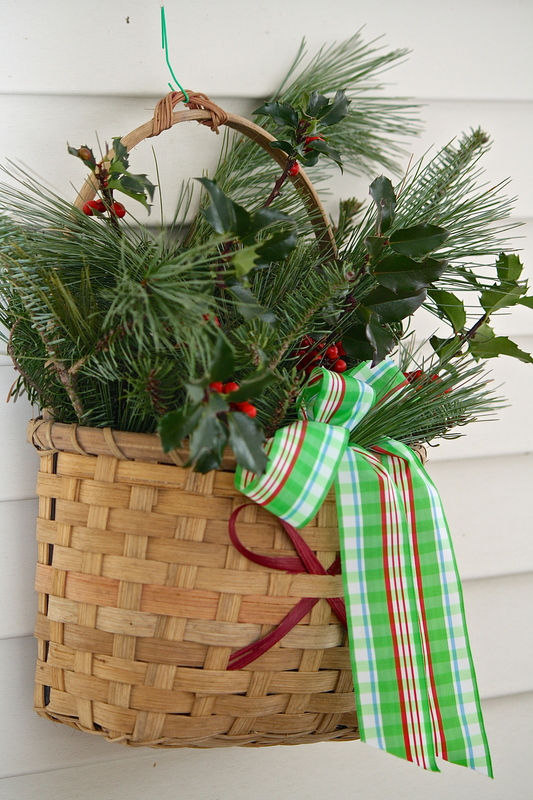 On the front porch, next to the door, I filled a wooden bucket with an arrangement of greens, again using the windfall and pieces of winterberry and holly clipped from the bushes in the yard. I have a little basket that hangs under the porch light that I change with the seasons and this gets fresh cut greens as well. Both get bows, of course! They lift my spirits every time I come and go, adding to the festive feeling in this season of Light. Participate in the Forest Garden’s Wreath Challenge by posting your holiday decorations by December 13 & link to FG ‘holiday blog hop’ posting. If you don’t have a blog and want to participate, there are instructions provided. I look forward to seeing how folks in various parts of the globe decorate. What do wreaths look like in Australia, Florida, Great Britain, Arizona and other places that offer different vegetation? Show us your wreaths! 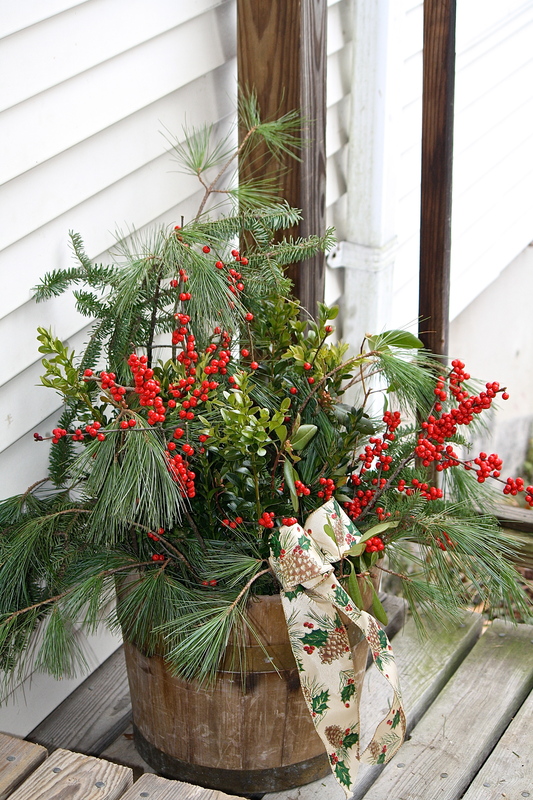 This entry was posted in Country Living, My Photos and tagged balsam, bows, Christmas wreath, decorations, evergreens, Forest Garden, holiday blog hop, holly, pine, seasonal, solstice, swags, winterberry. Bookmark the permalink. They all look so nice and you make it look easy but you have to have an eye to get balanced beautiful results that you always achieve! 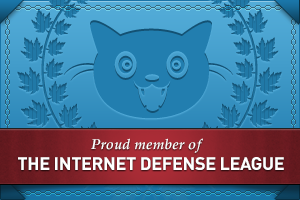 Aw, shucks, thanks sweetie – you are so kind! YES!! 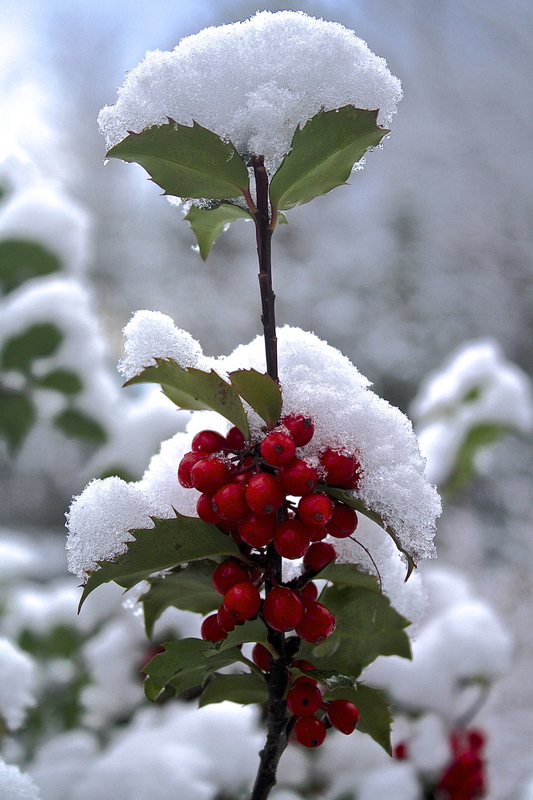 Mother Nature cooperated in your wreath-making efforts this year! I love everything about wreath number one including the gingham ribbon which goes so perfectly with the shed not to mention the brilliant use of grape vine. Then you carry that look through onto the swag and the porch decorations! Sending big kudos up to you, Eliza! I love it all! Wow… it’s so beautiful out there… I think holiday mood has started sinking in every one, right? Thanks, Sreejith. Have you ever seen snow in the mountains? Beautiful, but very cold! These are absolutely beautiful! You may have inspired me 🙂 Thanks for sharing. 🙂 Go for it. Creativity is good for the soul! Beautiful Eliza. You are very creative. I made one from willow last year – it’s in the workshop somewhere but you’ve inspired me to dig it out and spruce it up a bit! Eliza, you ae so very talented! I could use you around here as my holiday creativity only extends to red bows on things. Your wreath is stunning! Why, thank you so much, Dor. 🙂 I do love to make arrangements and if I lived closer, I’d come on by and whip something up for you! Thank you, Robin. We’re walkin’ in a winter wonderland! You live in such a beautiful area Eliza, I am not surprised you are inspired and so creative! Thanks for sharing. What absolutely stunning displays. They capture the Christmas spirit of joy and celebration with such beauty. Well done you! Thank you, Deb! I’m hoping you join the challenge, I’m curious about southern traditions that don’t have that postcard ‘snow on evergreens’ look. Enjoy the Season! Today I “decorated ” an eight foot high potted “Ficus Benjaminii” with a net of solar powered fairy lights. Here in southeast Queensland, Christmas is in Summer with high temps, thunder storms and hail storms, so we don’t employ fresh greens in garlands, but use dried pine cones, crow ash dried pods and artificial greens to make wreaths. But this year I’ll hang a patch worked piece on my front (screen) door. In the back garden I use a fruiting lemon tree as a Christmas Tree with solar lights and weather proof ornaments. Also there are solar fairy lights along side and back fences railing through blossoming Jasmine and Stephanotis creepers. I also have pots of Hydrangea, petunia, geraniums and calibrachioa blossoms to brighten my back patios where we spend so much time in Summer. Thanks Maureen, for taking the time to share what Christmas decorations look like in Queensland.I love the idea of solar lights (being high summer) but here the result would be dim and short lived, just not enough sun! I hope you post some photos of the lights through the fence, Jasmine & Stephanotis – it sounds heavenly and I wish I could be there to smell it! I wonder what crow ash pods look like and your front door piece, too. I hope you have a wonderful holiday. Thanks again for your visit and kind words! You made this look so easy! I felt I was looking at a magazine. Awesome work, Eliza! Boy, I’d love to! What a treat that would be for me! Oh my … so gorgeous! Thanks so much, Ana! 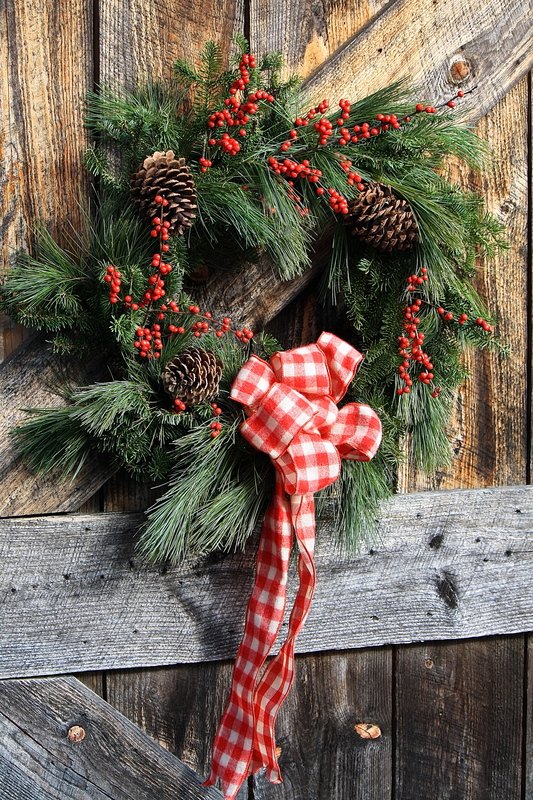 The wood shed is aging beautifully – a perfect background for the wreath. Thank you kindly! I feel a bit rusty, but I guess I can still come up with something when the need arises. 😉 Hope these creations can take the gusty nor’easter coming our way today. I love your natural decorations-the best! They are stunning compared to the gawdy things you can purchase—great job + photos! Thanks so much Robbie. Do you decorate for the holidays? It always gets me in the mood for Solstice/Xmas. Thanks, Robbie for your kind praise. It is fun to do a kind of ‘treasure hunt’ to see what the land and garden has for us to decorate with.